The leaf of the world’s oldest tree. Millions of years ago, Ginkgo trees covered the entire northern hemisphere. They thrived in China and returned as exotic park trees to the gardens of European nobility by way of Japan. Today spiritual and healing powers are still attributed to the world’s oldest tree which is an intermediate form between foliage and coniferous trees. 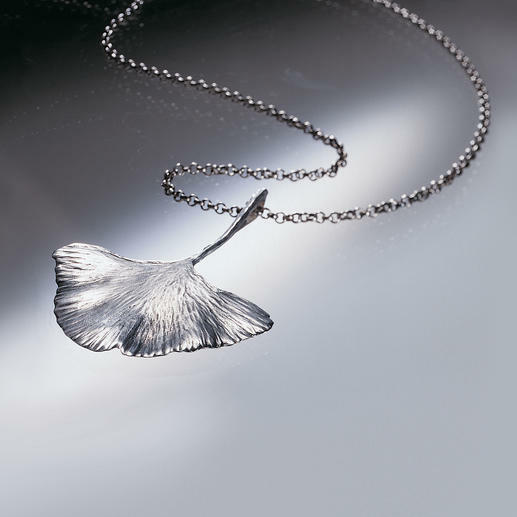 This silver pendant is a carefully handmade die-cast of the rare Ginkgo leaf in solid 925 sterling silver. Give the sterling silver Ginkgo leaf as a gift – an exceptional piece of jewellery in the shape of a leaf which even inspired Goethe to write a poem about it. The leaf in 925 sterling silver is approx. 50 x 55mm (2" x 2.2") in size and is supplied with a 45cm (17.7") long silver chain in an attractive black gift box. Exclusive to Fashion Classics.